Amtrak stops in Northampton and Greenfield have been added to its passenger rail through Massachusetts. In January, the number of riders at the two new stations was up 84 percent over their equivalent station in Amherst last year. 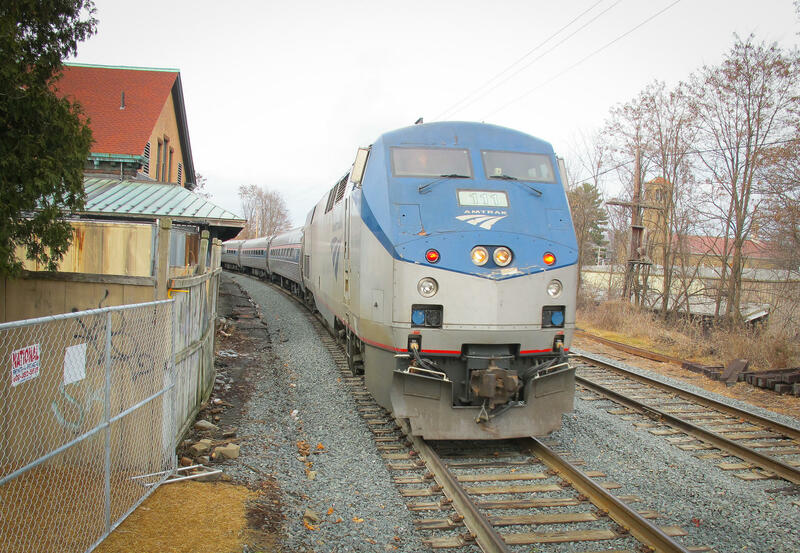 The new route for passenger rail through the Pioneer Valley in western Massachusetts is exceeding expectations, according to numbers from Amtrak. 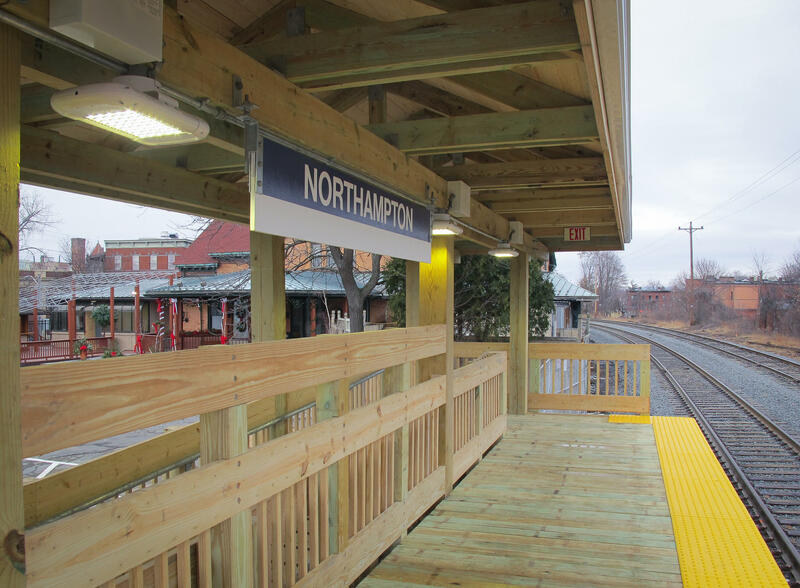 The service shifted west in late December, which eliminated a stop in Amherst, and added new ones in Northampton and Greenfield. State officials planned the move to speed up the trip and boost the number of riders. It was also expected to help the local economy. So far, it’s hard to tell if that has happened. In Greenfield, the train stops next to a transit center built a few years ago. Inside the center is a waiting area. However, there is no place to buy train tickets -- you have to do that online. But there is a small coffee shop that opened last fall. Kelly Goodwin, who works at the shop, said that the train hasn’t effected them much. “Because their hours are different than ours, we close at 1:30, and their first southbound train stops shortly after 1:00, we don’t have the same activity as we could possibly have in the future, if they would have more runs,” she said. With the addition of a stop in Northampton, several eateries have emerged in order to satisfy passengers. Right now, there is only one train in each direction every day, though state and local officials have talked about the possibility of commuter rail. The coffee shop is run by a rehab organization for adults with mental illness, so turning a profit isn’t its primary goal. Still, Goodwin thinks the train will eventually bring more business. I talked to two other workers at nearby restaurants – one a pizza place, the other a bit higher-end – neither would go on tape, but both told me the train hasn’t really had an effect on business. The two new stops have been good for Amtrak’s business. In January, the first full month of the new route, the number of riders at the two new stations was up 84 percent over their equivalent station in Amherst last year. Amtrak has not released the February numbers yet, so we don’t know whether that initial excitement has continued. 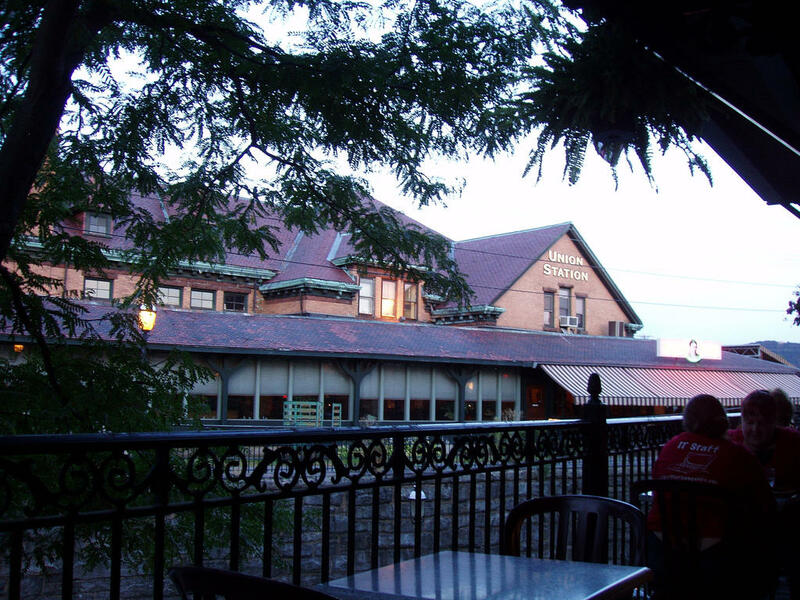 Northampton's old Union station is now home to Jeremiah Micka's Platform Sports Bar. Down the line in Northampton, the train stops next to the new Platform Sports Bar. Jeremiah Micka owns the bar, which opened last year inside what used to be the city’s Union Station. He said he didn’t factor the new train line into his business plan. Now that it’s started, he has said there are positives and negatives. “There’s the negative side of we’re now a local restroom. People who aren’t going to come and spend money are just kind of loitering. You’ve got a lot of traffic that just sits out there, especially during the pick up and drop off times,” said Micka. Nonetheless, Micka said, he’s glad to have the train close by. He also owns another bar called The Deck. It’s outdoors, and even closer to the new train station. It will open for the season around Memorial Day. The bar is right next to the train tracks, but Micka doesn't believe noise will be a concern. “It’s pretty funny when the train comes by, it’s the little kid in all of us. Everyone just pauses, and it could be the last thirty seconds of a major game, but everybody’s looking out at the train, because it’s just exciting, it’s really cool,” he said. According to Amtrak, initial numbers show that the new route for the passenger rail through the Pioneer Valley is exceeding expectations. After the 4:00 northbound train pulled in, a few passengers got off. One of them, Mike Barkigan of New York City, looked a little confused. He asked me where he can get a drink while he waits for his ride. I told him about the Platform Bar, and asked what he thinks of Northampton’s new train stop. “It just seems a little bland for a train station. I mean, there’s no one selling anything around here,” he said. I asked him what he would expect at a train station. “Definitely a lot more taxis, probably a place resembling a bodega of some sort to buy things people might want that aren’t accessible on some of the trains,” said Barkigan. For now, there’s none of that here. Of course, we’re talking about one train a day in each direction through the Pioneer Valley. No one should expect Grand Central Station. 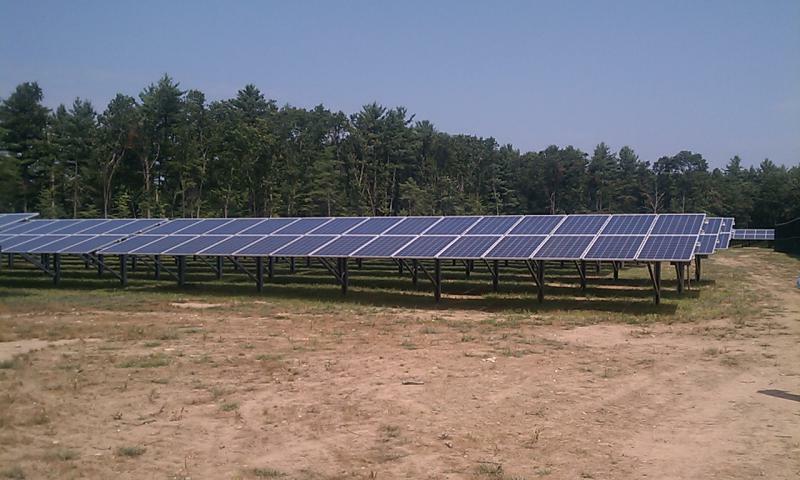 This report was originally published by New England Public Radio. MGM broke ground on an $800 million casino in downtown Springfield, Massachusetts on Tuesday. Company officials -- including Mike Mathis, MGM Springfield president; Springfield Mayor Domenic Sarno; and state Gaming Commission Chairman Stephen Crosby -- were all in attendance. New Haven Airport Could Restore Airline Link to Washington, D.C.
Officials at Tweed New Haven Regional Airport have said that they are negotiating with a Missouri-based airlines which could create an airline link between southern Connecticut and Washington, D.C.
Airport authority Chairman John Picard and Executive Director Tim Larson have said that the airport is negotiating with Buzz Airways of Branson, Missouri, to run regular, scheduled charter service between New Haven and Dulles International Airport in Virginia outside Washington. It’s hard to imagine what the regional music scene would have been like over the past four decades without the invaluable, energizing force generated by The Iron Horse Music Hall, the small but mighty powerhouse of an entertainment center in Northampton, Massachusetts.